Bioremediation is also attractive because of several advantages that its application has over more conventional technology. For instance, bioremediation techniques are typically more economical than more traditional methods. It is estimated that bioremediation would cost one-third to one-half that of incineration. In addition, in some cases pollutants can be treated at the site, thus reducing the risk exposure to cleanup personnel and potentially wider exposure as a result of transportation accidents (Gabriel, 1991). Furthermore, the techniques usually can be expected to have minimal environmental impact, since bioremediation is a natural process. Also, waste products are usually not generated, as bioremediation often results in complete degradation of the contaminants. These characteristics make bioremediation techniques potentially ideal for detoxification of chemical pollutants. However, there are a number of problems which are encountered with bioremediation as well. First, in order for organisms to successfully reduce pollutant levels, their population must increase. For this, their growth conditions must be determined and maintained at the contaminated sites. Controlling these conditions may prove difficult, particularly as conditions may vary so greatly among sites. In addition, the labor required to maintain optimal conditions may be extensive. Even in an ideal environment an organism may prefer to metabolize other more readily available nutrients within a contaminated area, or the pollutant may be completely or partially inaccessible to the degrading organism. Finally, the environment may contain substances or organism that inhibit growth of the degrading population. 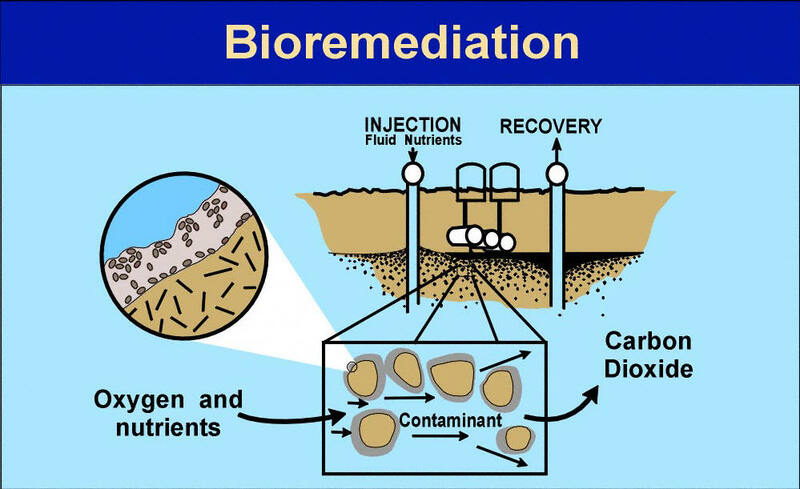 Nevertheless, many associated with bioremediation are already in the process of being overcome. Microorganisms capable of degrading recalcitrant compounds are being continually discovered using methods such as batch enrichment and chemostat selection. Degrading organisms may also be artificially generated by genetic engineering techniques. However, only when the introduced modified organisms has a selective advantage that is linked with the growth on the substrate of concern will they have the chance and advantage to compete successfully with the existing microflora in the contamined soil (Alexander, 1984). Other potential, but likely solvable, barriers to the use of bioremediation as a pollution abatement technology involve engineering and regulatory questions. In terms of regulatory pitfalls, only recently (in the 1980s) has in situ bioremediation efforts at both the state and federal levels. Lawyers have as much influence on decisions regarding bioremediation as scientists and engineers, leading to such regulations as those which strictly control the use of genetically engineered microorganisms (stroo, 1992). In addition, bioremediation may succeed in completely removing a given pollutant only to generate another possibly tocix by-product,; for instance, conversion of TNT to amines or azoxy dimers during composting or conversion of TCE to vinyl chloride by anaerobic bacteria in aquifers. Obviously, use of bioremediation requires careful monitoring by both the users and the regulators of this innovative, but not yet generally recognized methodology. Other factors limiting the utility of bioremediation concern engineering design and application. First, the chemical and site requiring decontamination must be assessed to determine suitability for one of the bioremediation techniques. Most importantly, it must be decided if, in fact, bioremediation is the option of choice for removal of the pollutant from that particular contaminated area, as alternative methodologies might be better suited to certain scenarios. For bioremediation to be feasible, the compound must be biodegradable and the environment appropriate, although in some cases, inappropriate conditions can be remedied by adjustments involving nutrients amendment, pH or water content alterations, reduction of toxins and elimination of predators. In addition, organisms capable of degrading the pollutant must be available and capable of transforming the compound under field conditions. Herein often lie difficulties in moving from bench- and pilot-scale studies to full-scale field operations (Gabriel, 1991). 0 Response to "Advantages and Disadvantages of Bioremediation"